It started as a joke, a riff on the big MLS announcements in south Florida. 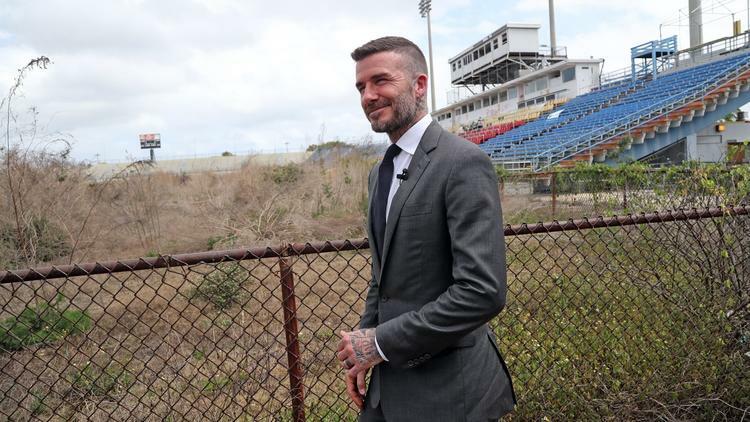 A month ago, David Beckham and his business partners standing in the shell of Lockhart Stadium: “The vast history of soccer in South Florida has deep roots in Fort Lauderdale dating back to the original Strikers of the 70’s and 80’s, the Miami Fusion of the 90’s and early 2000’s as well as the recent clubs that have called Lockhart Stadium their home.” The announcement was meant to give their plan for the Stadium a little umph in the face of local opposition. But it didn’t ring true for fans of soccer who had lived through those eras of soccer in Florida. For Derek Reese, President of Himmarshee Football Club, it was a clear sign that “MLS still, 20 years after the Fusion, not really understanding the nuances/realities of the south Florida market and that Fort Lauderdale is not part of Miami.” Fort Lauderdale is indeed not part of Miami, no matter how hard InterMiami (or whatever that club is called after they are sued by InterMilan) wishes it is for the purpose of solving their real estate issues. In fact, it is 40 miles north and a complete different culture from Miami. So with April 1st on the calendar and so many clubs posting social media jokes, Derek decided to do their own for Himmarshee, but riffing off the idea of Fort Lauderdale being distinct from Miami - “that's where the genesis of the idea came from.” So Reese, who does the kit design for his club decided to throw together a fake kit with the idea of tossing a jab at the Miami MLS people. But the joke wasn’t received the way Derek had expected. In fact, it was “almost immediately. Within a few minutes of posting it we already had comments from people wishing it was real and wanting to buy one.” Almost universally, the kit was applauded and appreciated. Everyone wanted one. So the club saw a way to capitalize on the interest and decided to manufacture the kit. The jerseys will be sold for the same price as the club’s regular jerseys ($50), with a portion of the proceeds donated to the You Can Play Project. Himmarshee has done this with all of their jersey sales so far, with the logo of the organization on the front of their kits. You Can Play Project mission is “ensuring equality, respect and safety for all athletes, without regard to sexual orientation and/or gender identity.” It’s a cause near the heart of the Fort Lauderdale community and for the club, it just made sense to support them. Himmarshee Football Club was formed by a group of Fort Lauderdale Strikers’ supporters with the intent to accomplish a host of things, but most importantly “supporting our highest level local club, the historic Fort Lauderdale Strikers, through supporters group Flight 19, operating our own competitive adult amateur team and recreational sides, organizing casual pick up games and other events to bring the soccer community together, and supporting and organizing local charitable efforts – both relating to soccer and general community causes.” The club is owned by its members and is one of the most progressive and idealistic clubs to ever come to south Florida soccer. Image courtesy of Himmarshee FC. If you’re interested in supporting Himmarshee FC by becoming a member, the cost is only $25. Of course, you can also support the club by purchasing one of these April Fool’s joke kits (called “The Map Kit” by the club), they are now available for preorder on the Himmarshee website. Besides supporting a great club and important community work, you’ll also never confuse Miami with Fort Lauderdale.